I hope you all had a great weekend! I got lots of fun things done (more on that later), but one of my most relaxing days was Sunday. Right before my Sunday nap, I took a hot shower and then covered myself in coconut oil. That is something I've been doing every day after each shower for about a month. 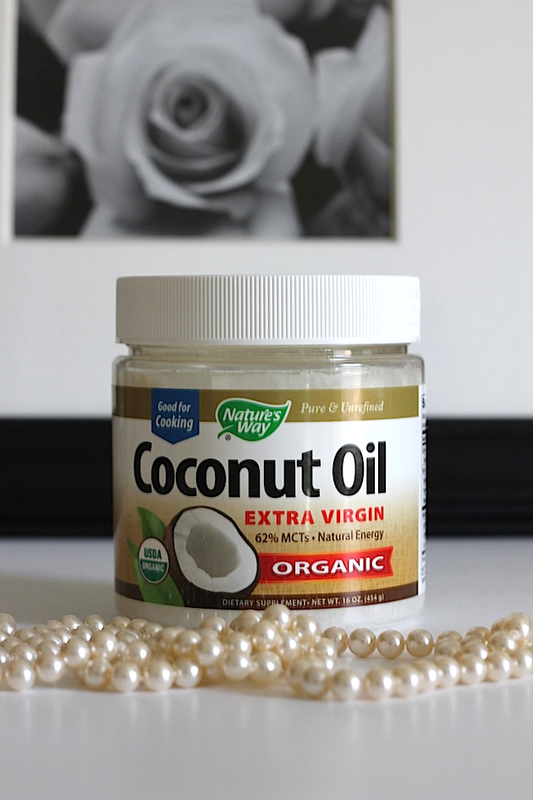 What it has done for me prompted me to do something odd like photograph a jar of coconut oil. :) But I have to tell you what its done for me lately! 1. Body Moisturizer: Right after each shower, while my skin is still slightly damp, I put the oil all over my skin. It comes in a solid form, but melts as soon as you rub it between your hands. My skin is oily right after I put it on, but it completely absorbs in my skin after about 10 minutes. Not only does it smell divine, but it leaves my skin feeling so incredibly soft and moisturized! 2. Eczema Treatment: When my eczema flairs up, it takes a really long time for it to go away and it often leaves dark marks on my skin as if it is marking its territory. I H-A-T-E it, but it is something that I've dealt with my whole life. But coconut oil has been extremely helpful. I apply it directly to the affected area a few times a day. It soothes my skin and has greatly reduced the time it takes for the breakout to go away. If I have a really stubborn breakout, I use it in addition to my prescription cream. Before I started using the oil regularly, I had some dark spots from older eczema flair-ups. After applying the oil every day for a few weeks, the dark spots faded significantly! 3. Dry Scalp: My scalp is extremely dry as well. I have little dry patches in certain areas of my scalp and I have been treating them with coconut oil. I melt some oil in my hands and dip a Qtip in the oil. I then rub the Qtip over the dry area. It stops the itching and moisturizes my scalp. Grapeseed oil works well here, too. I plan to take this a step further and completely condition my scalp with coconut oil right before I wash my hair. I hear that works wonders. 4. Smoothie Ingredient: When ingested, coconut oil can increase the body's resistance to illness-causing viruses and aid in the prevention of heart disease. It can also increase metabolism and energy and lower cholesterol. Sign me up! So I now add a spoonful of it to my daily breakfast smoothie to get those added benefits. We will see how this works in the summer, but I highly doubt I will go back to my regular lotion that was full of all kinds of crazy ingredients. I love that the oil is natural and that it smells so good. As I mentioned, the pure, unrefined, extra-virgin, organic coconut oil is what is best. I purchased the Nature's Way Coconut Oil from Amazon, but you can also find coconut oil at health food stores like Whole Foods. Do you use coconut oil?? If so, how do you use it?? I'm obsessed with coconut oil - I mostly use it as a hair mask or moisturizer, but it also comes in handy as makeup remover! I've never thought about ..... but now you have me convinced and will try it! Thanks! I primarily use it to make homemade granola (YUM! ), but I do sometimes use it as a moisturizer as well, especially in these dry winter days. Oh my goodness, I love coconut oil. I am a fan of all of the uses you list ... and I even use it to clean my mouth. Have you heard of oil-pulling? Weird but awesome. We recently moved to France and I can't find it here ... having withdrawls!